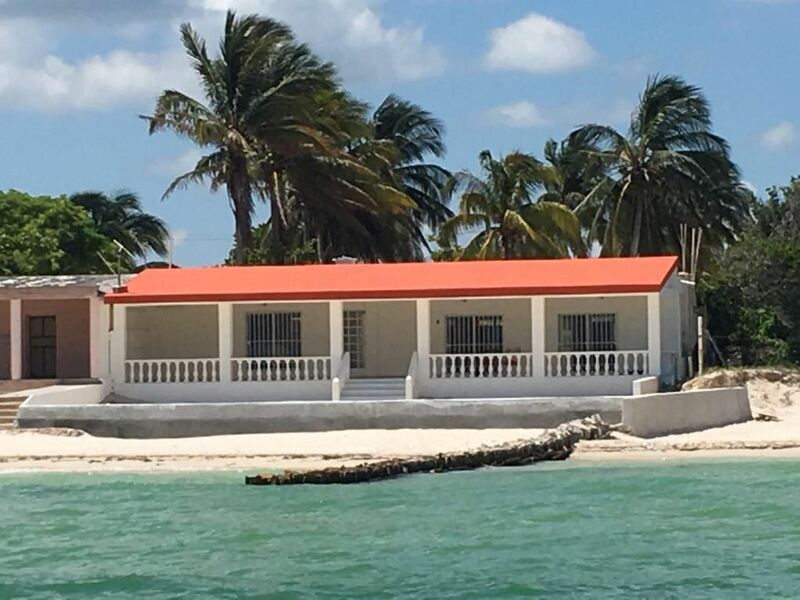 MAR es una de las 4 unidades en la propiedad y se encuentra en la casa de la playa con acceso directo a la veranda, con vistas al Golfo de México. También tiene ventanas que dan al patio. MAR TIENE 2 DORMITORIOS COMPLETOS CON UNA CAMA DE REINA Y UNA CAMA DOBLE CON UN ÁREA DE ASIENTOS PRECIOSAMENTE ABIERTA. Los cubrecamas son de Oaxaca. La unidad tiene aire acondicionado y también tiene ventiladores de techo. Hay una cocina totalmente equipada con nevera de tamaño completo y estufa / horno, utensilios de cocina y suministros y también ofrece un área de comedor. El baño está completamente actualizado con una enorme ducha y viene con toallas, champú y gel de ducha. Esta es verdaderamente una gran sala para una escapada y te permite dormir por la noche con los suaves sonidos de las olas. Hay una zona de barbacoa, ducha al aire libre y seguro, estacionamiento cubierto. El patio está bellamente ajardinado y el área de la piscina permite otra manera de refrescarse. Baño completo, toallas y toallas de playa, jabón y champú. A well maintained quiet facility of 4 units located on the gulf in the village. This charming unit has a huge shaded verandah, small private beach with water's edge right of way for beach walks. Bars and restaurants are walking distance. For a few pesos you can get a Collectivo to the larger port of Progresso where you find supermarkets, ATM machines and full shopping. Kim was a wonderful hostess who picked us up at our hotel in Merida and gave us useful tips for shopping and dining and attentive to our needs. Highly recommended. Beautiful place & strategically located. Great place to stay, very clean, wonderful oceanfront. Close walking distance to eateries & shopping. Kimberly oversees the place & she is wonderful & helpful. Victor oversees the grounds keeping & he too is great & very helpful. We actually extended our stay we as we having such a great time! We stayed at Chelem for 3 nights and had a spectacular time. Rick answered all our questions really fast and over it was an amazing experience. I would recommend this place for anyone wanting to have a very relaxing time right in front of the beach. Thanks for choosing to spend some time with us Martin. It was a pleasure to host you and your party. We would love to have you back anytime! Mir hat es in Vida Chelem sehr gut gefallen. Es war ein rundum gelungener Urlaub. Vielen dank an Kimberly und Stan. Thank you for your kind words Silvia. It was a pleasure to host you, and we look forward to the next time! An absolutely wonderful little oasis on the beach run by owners who truly care. My partner and I spent a week in Sol and a 2 weeks in Mar. We were very happy in both. From the moment you walk into the walled securely walled courtyard with small pool and gardens you know you are in for a treat. suggestions to make additions or changes. (ie: immediately providing a small chest freezer for those of us who wanted more ice and a place to freeze extra food) Any problems or issues were attended to as quickly as possible. Kim is the local contact making it easy to learn everything you want to know about the area regarding restaurants etc. She is (along with Stan) kind, receptive, and fun too!!! chatting with other guests . In all, a very special spot to revisit without hesitation! Thank you so much for your kind words Dorothy. You and Bruce were truly a treat to host and we were very sad to see you leave. You are an amazing couple and we would love to see you again- anytime at all. Our stay here was wonderful the property was beautiful and Kimberly was the best we will be back for sure and will bring my sister and husband . Can't say enough good things.the only thing wrong was our stay was not long enough next time though. we are anxious to have you and your family back as well. The few short days you spent with us were great and we will gladly host you again!